Love is a wonder, and no doubt other living forms can also fall in love apart from human being. In Muenster, north western Germnay, a rare black Australian Swan has been showing all typical love signs for its species, a plastic swan-shaped paddle boat. The swan has been circling its plastic lover, staring endlessly at it and making crooning noises. It is supposed to fly south for winter. 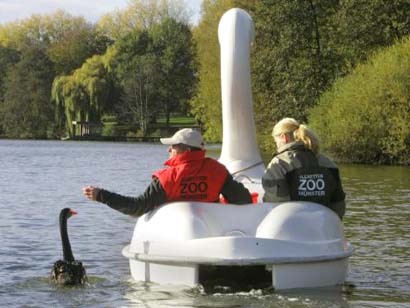 The park-keepers said that the swan refused to leave the boat on the Aasee Lake – which also should be taken off during the cold weather. The swan has now been moved to a zoo with his plastic lover. This entry was posted on Thursday, November 9th, 2006 at 2:33 pm	and is filed under Interesting Stuff. You can skip to the end and leave a response. Pinging is currently not allowed.